Calanthe orchids are a cool growing genus divided into evergreen and deciduous species. The Christmas Orchid, Calanthe triplicata (Christmas Orchid) and other Calanthe species are a wide spread group of terrestrial orchids some native to Australia and some not. C. discolor is from Japan where it grows in forested areas. Calanthe tricarinata is more wide spread. C.sieboldii has large yellow flowers and is fairly hardy in a woodland situation and C. dominii is a very old hybrid. C. vestita is worth looking for as well. Plant Calanthe in semi shade for best results. However being a fairly varied group we suggest you seek specific growing and care instructions on purchase. As a general rule they do require a well drained soil and a position in semi shade. It is best to amend the soil well before planting. Some blood and bone and a little lime can also be added at this time. Dig through some well rotted compost, and some material to improve drainage. Perlite or course river sand is excellent to improve drainage in boggy soils. Although Calanthe Orchids can be grown in containers, they need to be kept out of the sun, especially in summer. High soil temperatures will kill these orchids. 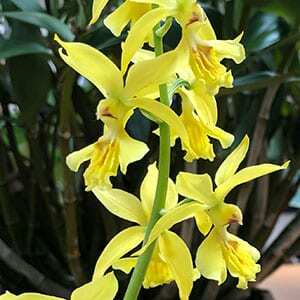 They are also an orchid that requires a reasonably dry dormancy. Calanthe Orchids are now much hybridised and with long arching flower stems are a graceful addition to any orchid collection. C. sieboldii with its yellow flowers prefers part shade. C. rubes is originally from Thailand and has pinkish red flowers. C. discolor is from Japan and is a cold hardy species. C. reflexa is a late bloomer, also from Japan. C. triplicata is an evergreen species from Australia (Queensland) where it is known as the Christmas Orchid. C. vestita is a popular indoor plant.